When you give a donation to Shades of Grace Ministries, you are bringing God’s comfort for life’s trials to someone in need! 501(c)(3) of the Internal Revenue Code. Your donation is tax deductible as allowed by law. 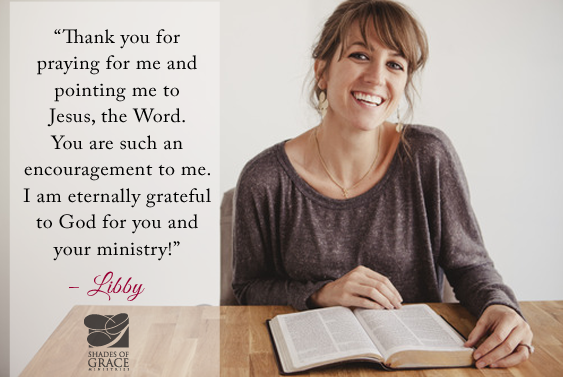 It is such a joy for me to welcome you to our ministry family! When we make a new friend who is excited about what we are doing, we feel even more inspired about fulfilling the vision God has given us as a ministry. 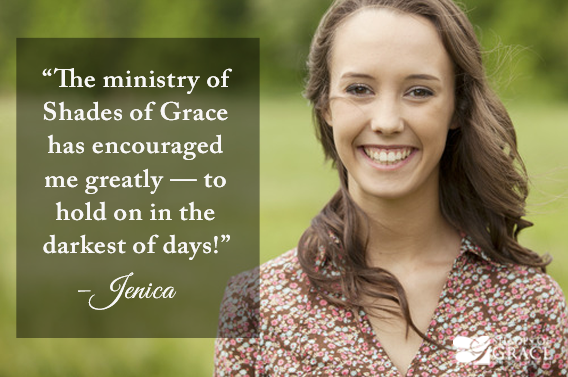 Here at Shades of Grace Ministries, our mission is to share God’s comfort for life’s trials. This mission is the passion of my heart. 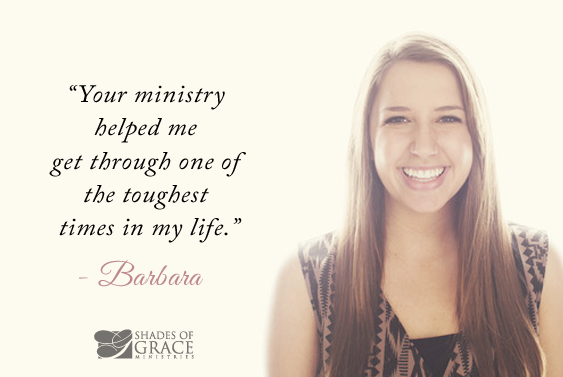 Through years of immeasurable suffering, God’s Word sustained me. His grace carried me through. And I imagine that He has done the same for you – through trials great and small. What would you and I have done if someone had not shared God’s truth and comfort with us? The thought is unimaginable! 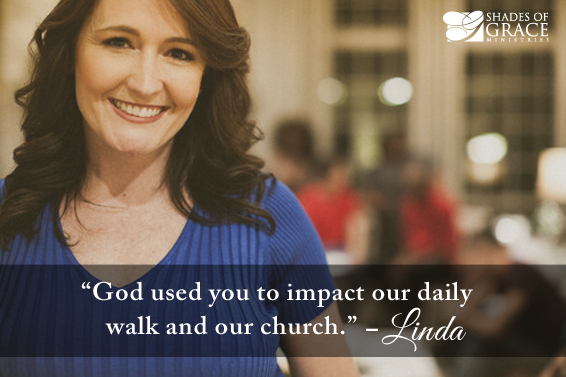 That’s why I want to personally invite you to join me on this mission of sharing God’s comfort. 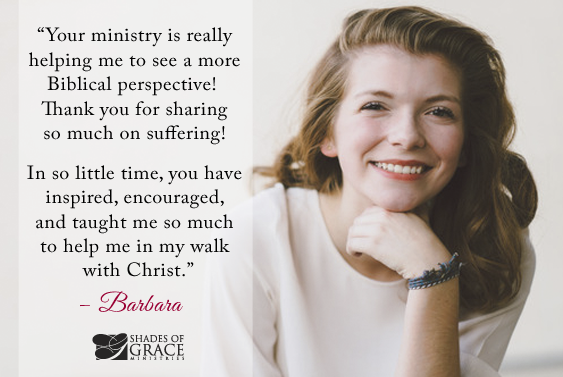 Shades of Grace is a faith-based organization supported by friends like you who want to give people hope in the midst of their suffering. 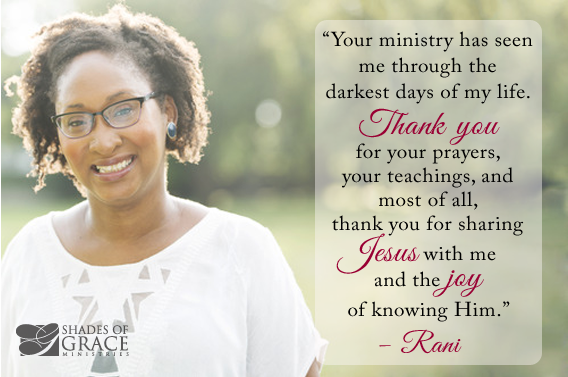 We are grateful for those who support this work through generous gifts, both large and small. All donations are secure and your information will not be shared with other parties. When you give to Shades of Grace, you are sharing God’s comfort for life’s trials with many lost and hurting people who need Christ. Through your support, you are bringing the life-changing Word of God to someone who desperately needs a touch from the Lord. Would you pray about what donation God would have you give today? Your gift allows us to reach more men and women in the midst of their tests and trials — and point them to Christ! What joy it is to see each person given a new chance at hope and life as they receive God’s powerful Word!! Thank you in advance for your gift. Thank you for making an investment in eternity! You are a valued member of the Shades of Grace team — a critical part of all that God is doing to change hearts and transform lives. We couldn’t do it without your support! May God fulfill His promise in your life: “A generous man will prosper; he who refreshes others will himself be refreshed” (Proverbs 11:25). May God bless you in every way possible for your faithfulness to His kingdom!